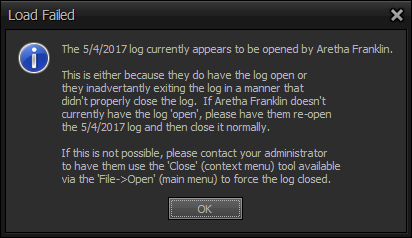 There are multiple ways that you can Open/select a log. First and the most direct is to click on the dashboard "notices"
This will take you directly to the first log on the list. Clicking Yes: Will take you to the log that needs to be reconciled. Third way to Select a log is in the Log itself. 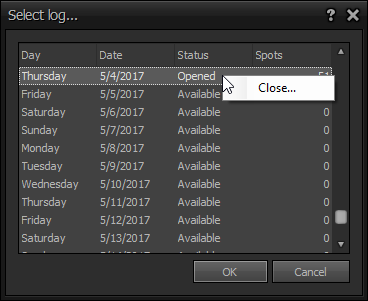 You can "Open" the Select log window. This can be done two ways. Either click Open under "File" or click the folder icon. 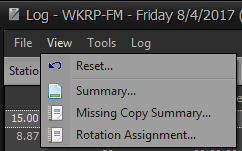 These are labeled "Previous Log" and "Next Log" Simply clicking either will move you forward or back through logs. Right click on the Date marked Open, The Close box pops up. Left click to close the date. The main menu has a lot in it and we must discuss this first to make your Log working much easier and faster if you know about these things. Save - Saves a log to the database. Lock - Locks a log, assigns carts, exports the log to automation. Begin Reconciliation - Can only be done on a log that had played. reconciles what has played and compares it with the aired log from automation. Commit Reconciliation - Can only see after begin Reconciliation has bee completed. Will commit that days logs to the invoice. This is just a check to make sure everything is right, giving you a chance to check the day's logs. Reverse - If you need to reverse a Committed Reconciliation. Export Automation - If you want to export a Locked log to an Automation system. Print Preview -To preview a printed log. Close - To close the log. Reset - This resets the log page to base settings. Missing Copy Summary - See Below. Rotation Assignment - See Below. Because the Log is a sequential list that needs to be edited (and reviewed) based on the times; we provide the log summary as a means to see the information organize in any manner that you wish. This window is launched by using the main menu of the Log (View->Log Summary). Print previews the current view. Exports the current view to an electronic document of your choosing. Resets the view (modified using MyViews) to the factory-original state. The main body of the window represents the actual log summary. You can leverage the capabilities provided by MyViews to present/view the information in a way that best represents how you want to organize the information. Event Time - See Log. Start Time - See Contract. End Time - See Contract. Target Date - See Contract. Avail Time - See Log. Avail Type - See AvailType. Cart # - See Copy. Copy Name - See Copy. End Date - See Contract. Entered By - See Contract. Event Type - See Log. ISCI Code - See Copy. P.Conflict - Primary Conflict; see Conflict. S.Conflict - Secondary Conflict; see Conflict. Sales Person - See Salesperson. Start Date - See Contract. Regardless of type highlighted item. When highlighted on an avail, automation command or log note. Moves the highlight to the top of the log. Move the highlight to the bottom of the log. When highlighted on a spot. When highlighted on a bumped spot. Moves the highlight to the top of the list. Move the highlight to the bottom of the list. When highlighted on an invalid copy item. Bumps highlighted spot from the log. When highlighted on a make good. If you have special spots under the Invalid Copy tab under the schedule, navigate to the View drop-down menu and select Missing Copy Summary. You can print or export the report to help you identify the missing copy issues. 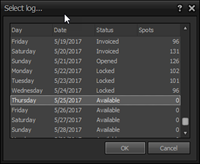 To print the log with cart numbers on it, after locking the log navigate to the File drop-down menu and select Print, or use the Print icon on the toolbar. The logs must be locked or unlocked in chronological order. This means that before you can lock the log for Friday all the logs for all previous days need to be locked. Automation Commands - See Below. Log Notes - See Below. This opens up the Avail window from settings. 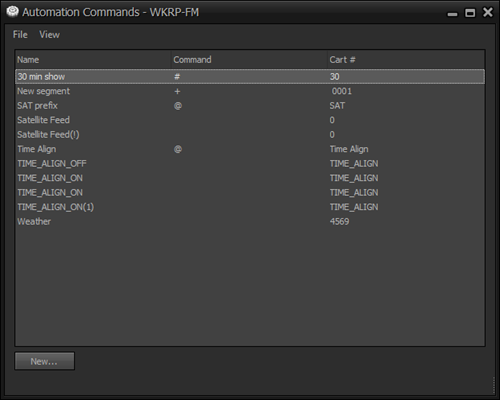 The Automation Command window is where you go to add the commands to trigger to your automation system. Print - Prints the existing visible list. Print Preview - Print previews the existing visible list. Close - Closes the window. Trashed - Checkmark on or off to show Trashed Avail Types. Reset - Using MyViews you can design a layout that best suites your personal working style; this option serves as a means to reset the layout to "factory original". Refresh F5 a page refresh. 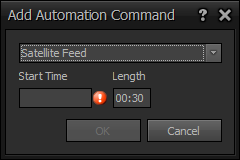 Place the Name you want, Add the Command to your automation system, then add the cart#, click OK to save. EC If you don't have a cart number you have to add a space in the cart# box. Name - The name of the Avail. Merge - Provides the ability to merge the selected item with another. You highlight the item you want to merge (remove), right-click, select Merge. Upon doing so, you will be prompted with a list of the other items to select which item you wish to merge to (keep). Everywhere where the merged (removed) item is currently in use will automatically be replaced (updated) with the selected (kept) item. Trash - This places the Avail in a Trashed a state which hides it unless you have the "trashed" checkmark under View in the main menu. You can at any time right click on a trashed item and Untrash it. Which bring up the Add Automation Command window. 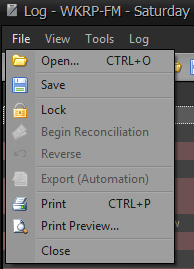 Just pick your Automation Command from the drop-down place in the time you want the note and click OK. If you want to add a note to your log you can go to Log notes and create one to save and use over and over or create many to use at your discretion. Within this window is a list of your saved notes to choose from. New - Opens the New window. see below. Print - Prints the current view. Print Preview - Print previews the current view. Trashed - Check on and off to view the trashed notes (Have to see trashed to untrash. Reset - Resets the view to the factory-original state. Place your note and click OK to save. Which bring up the Add LOG Note window. Just pick your note from the drop-down place in the time you want the note and click OK. 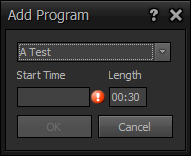 If you want to add a Program to your log you can go to the Programs window and create one to save and use over and over or create many to use at your discretion. Within this window is a list of your programs to choose from. Open - Opens the highlighted section in the New window for changes. Refresh F5 - Clicking F5 refreshes the window. Place your programs add a cart# and click OK to save. Which bring up the Add Programs window. 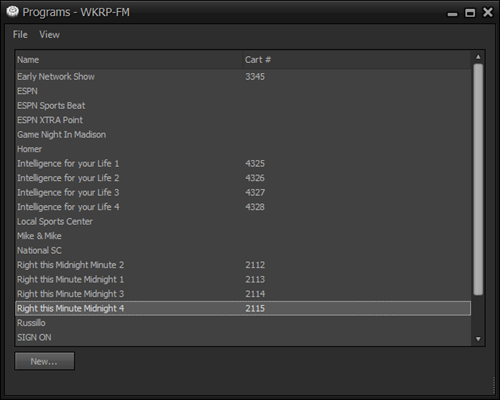 Just pick your program from the drop-down Add the Cart# with the length of the spot and click OK. In this window, you can select how you want your logs printed. And check the boxes that you wish. In this window, you can change the color of individual things within the log. choose what you want to be colored then use the drop-down to change the color of the desired avail or conflicts. Expand All - Expands the entire log to open every placement. Collapse All -Collapse the log down to just the breaks. Write on Spot - See Below. Bump All Spots - Bumps all spots making the log empty. You will first need to make sure there is a contract entered to include this spot. Quantity: as places on the weekly schedule set by the contract. S.Conflict: The Secondary Conflict entered on the Contract. New contracts applied to a saved log- When a contract is updated or new and the log is saved. the log will post these new spots will be on the bumped list. This is a good place to talk about Composite Avail Types. Station Scheduling Weight - Sometimes you want to give more weight to the rate of spots, other times you may want to have more control by giving more weight to the "placement level" that you define. This can be configured according to your preference as to what will be given more weight first, second, etc. If all things being equal on the first, the second is evaluated and so forth. Log Generation - The number of days into the future that the "structure" of a Log is generated so that scheduling can take place. Format - Additionally, Formats are defined on a per Station basis. Each Format defines several details regarding the "how" a Log should be structured; specifically, regarding the scheduling of spots, the avails (see AvailType) are added defining the when, available time and a maximum number of spots that can be placed. It is also possible to "weight" these avails to create preferential placement on a per avail basis. Priority - A number 1 and 9 that defines the weight in relation to other avails defined. You can leave the priority set to nothing (blank); these will be treated as the lowest priority (if, of course, any other entries actually contain a number). Target Date - On a ContractLineItem, you define a date range and within this range, possibly a pattern to target one or more days of the week (or using Daily scheduling to target specific calendar date(s)). 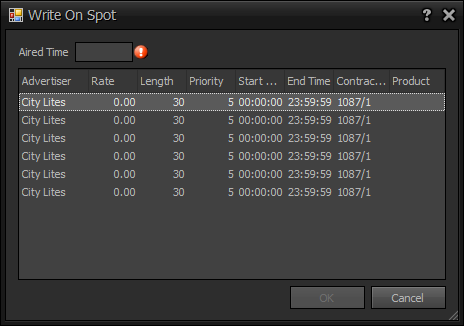 When the Contract is approved, spots are created to target the defined criteria and each "target date" is used to determine which Log the individual spots should land. Start Time - The Start Time and End Time fields on a ContractLineItem define the range of time that a particular spot can be placed. End Time - See Start Time. Avail Type - On the ContractLineItem, you define where you want spots for this billing line to fall; this aligns with the respective Avail entries contained on Station Formats. Primary Conflict - Each Contract can have a primary Conflict and secondary Conflict defined that will be applied (restrict). The placement of scheduled spots will not place within the defined criteria; which can be defined on an avail Format or minute (time) basis with a related separation amount that represents the amount accordingly. It is possible to set the Conflict to None; effectively removing the restrictions. However, other surrounding spots may still have Conflicts and those will still have the restriction(s) applied as expected. Secondary Conflict - See Primary Conflict. Override Conflicts - Each ContractLineItem can further define whether or not to participate in Conflict rules; to not participate, place a check mark next to this field. Effectively works the same as setting the Primary Conflict and Secondary Conflict to None; but on a per ContractLineItem basis. Customer Separation - You can define, on a Customer basis, the amount of minimum separation that will be applied (restricted). This can either be on an avail Format or minute (time) basis and the related separation amount is the amount respectively. Taking all of the information into account, the list of available spots is first sorted by using a number that is a composite of the Station Scheduling Weight described above and a separate list of available locations on a Log is determined. Using these two lists, the placement engine starts with the high priority spot and works its way through to the last spot on the list. For each spot, a list of avails is determined and sorted by priority; again using all of the above criteria. For each priority level (See Format), an avail is determined at random. Once all of the avails have been evaluated, the next priority level is processed accordingly. Each spot is attempted to be placed into these avails verifying that all of the rules are not being violated. If a particular avail does not work, it is removed from the list for this spot and another one is chosen at random. If all avails have been exhausted, the spot remains on the bump list. When the Log is locked, the Copy assignment process is executed. Through this process, the Copy associated with each Contract is evaluated (and potentially rotated if used) to assign a legal piece of Copy based on all of the rules defined to a particular spot. This determination is also done in the background (without the rotation aspect) to assist in notifying you that there are potential spots that will not be able to have Copy assigned. If using an AutomationSystem, the Log will not allow locking until all spots that have missing Copy are resolved by either getting Copy assigned or removing the spot(s) from the Log. It is important to remember that the only point where automatic placement occurs without User interaction is if, which, in of itself is a User interaction, the Log is opened and currently contains no spots on the actual log; meaning all of the spots are still on the bump list. These spots do not "save" on the Log until the Log is actually saved. You can use the Bump All Spots menu/button to remove all spots back to the bump list and subsequently use Automatic Placement to start from anew. To get the best possible results, this is the method that can provide the best opportunity for placement given that everything that can be on the Log is evaluated at the same time. 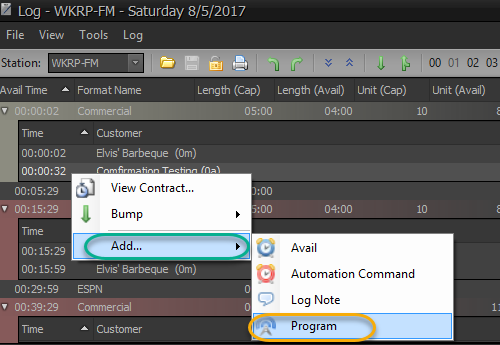 You can also use the Bump by context menus (available on the Log) to bump spots by a wide assortment of criteria and capabilities. 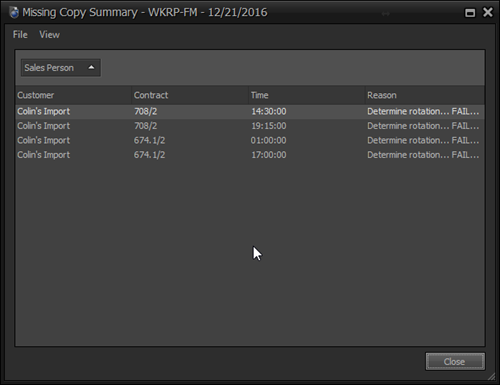 Automatic Placement can be run at any time throughout the Log editing process; regardless of how many spots are already on the Log. This means you can bump all spots of a particular placement level and then re-run the Automatic Placement process to re-process those items that are now on the bump list. There is nothing in the system that will "automatically bump" spots; this is because doing so may produce undesirable results, possibly undoing work that you've spent a considerable amount of time. Again, we do not do anything automatically with regards to the Log without your express consent (actions). We strive to make this all as easy as we can while still providing you a much control as you may desire in the process. 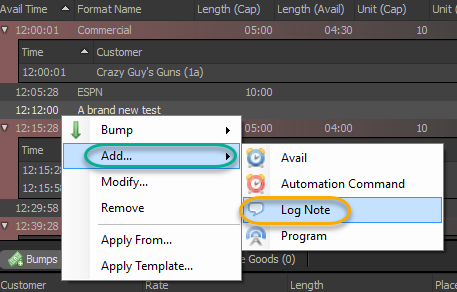 The log editor is where you will bring together everything related to Customers, Copy, Rotations and Contracts to create the schedule that is typically be sent to the Automation System to go on-air. 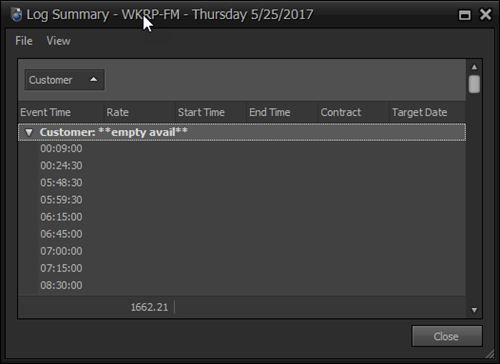 Also, the log editor window is where you to reconcile what aired, which is what actually creates and populates the invoices for billing. This reconciliation process can be done more efficiently by leveraging the assisted reconciliation capabilities we have with many Automation_Systems. The log can be launched directly from the Dashboard. 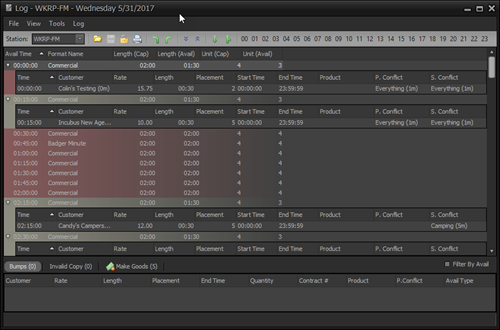 The log editor window has your schedule at the top and some tabs at the bottom are spots that need your attention. The toolbar across the top of the window provides access to several common useful tools. Select which log (by date) to load. Save any current changes made to this log. Lock (and save if necessary) the active log; exporting the result to your defined automation system. Close the current log and load the previous days log. Close the current log and load the next days log. Remove all spots from the log and place them on the bump list. Attempt to schedule all spots in the bump list to the log. F1 : Launches the help system (requires correctly configured web browser). Enter : Opens the Add Avail on empty spot. Shows the Contract if the spot is placed. Del : Removes the selected spot. 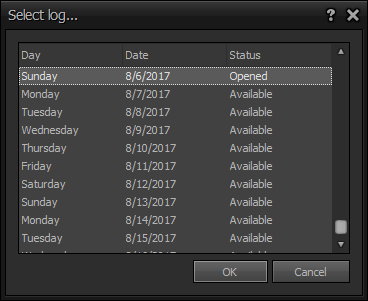 CTRL+O : Opens the Select Log window to move to a different log day. CTRL+G : Opens the Go To window, Select a time and go straight there. CTRL+P : Prints that days log. Up Arrow : Moves navigation up. Down Arrow : Moves the navigation down. Home - Jumps log to the first days spot. End - Jumps log to the Last days spot. Drag and drop each spot to an avail. Highlight a single spot on the schedule by clicking on it. Drag the spot to a different order in the same break, into a different break, or down to the bump list. At any time you can Bump all spots, This removes all spots from the schedule and places them on the Bump list below the schedule. We have made it easier to see if you have a spot that has been shift drag and dropped to a time that doesn't adhere to the daypart defined within the contract. TODO - Need to discuss how to modify a days log so that it modifies the structure of all future logs of the same day; if so desired. The BUMP menu is used removing items from the breaks. There are many options for removing spots. Bumps all spots for the Customer whose spot is currently highlighted. Bumps all spots from current avail. All spots currently on the log. Bumps all spots in the avail types of the currently highlighted spot. 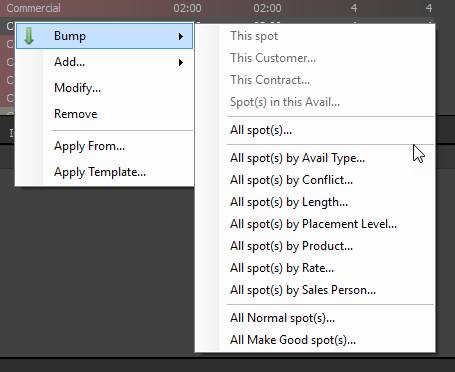 Bumps all spots with the same conflict type of currently highlighted spot. Bumps all spots of the same length of the highlighted spot. Bumps all spots the the same Placement level of currently highlighted spot. Bumps all spots with the same Product of the currently highlighted spot. 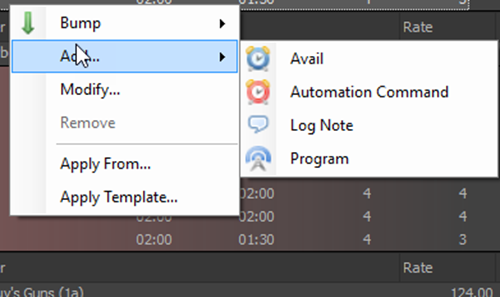 The ADD option gives you the opportunity to add an element to the template that you could add from the templates editor in the administrator section of the program. EC You can see these 4 abilities above in the Tools>Elements. The REMOVE option allows you remove a break or other log element entirely. The Apply TEMPLATE option allows you to add any template created in the Administration > Template section of the program. This is where you insert special templates for events like sports broadcasts. Note: Once these templates have been inserted into the format, you CANNOT undo this change. These include spots that have been bumped, excess inventory, and all spots with an invalid copy. This shows you all of your spots that are awaiting placement within the log. From here you can drag and drop them into a spot. Customer: The Customer of the bumped spot as per the contract. Quantity: Quantity, the amount of spots. Contract#: The Number of the contract. Product: The product if you added one to the Contract page. P. Conflict: The Primary conflicts. Agency: If the contract has an agency. Estimate #: The Estimate number (if it hs one) located on the Contract. Owner: The owner of the contract. PrePay: If this is a Prepay. check marked on the contract. S. Conflict: The secondary conflict. Sep Amt: The Separation Amount. The number between Avails or minutes. see conflicts. Sep Type: The Separation Type. Either avails or minutes. Spread: The list of times this spot played for that log. Target Date: The date of the bump. View Contract: Pulls up the Contract connected to this bumped spot. 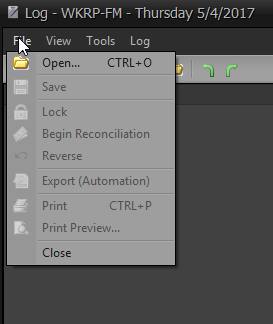 Execute Automatic Placement: Same as the button under Log in the Main menu. Reschedule: Opens up a "Date to Reschedule" window. Pick a new date, click ok to move bump to that day. Trash: To trash a bumped spot. 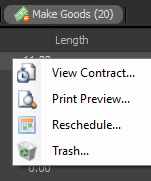 Place the spots from the Bump list into the schedule by clicking the Execute Automatic Placement icon in the toolbar, or drag and drop them into the schedule. Reason: The reason the copy became invalid. 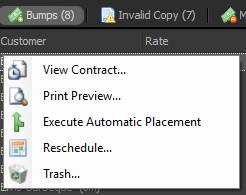 Remove: Removes that Invalid Copy to the Bump list. You can check the contract to see why it may be invalid, or remove it to the bump list. Avail Type: The type of Avails. 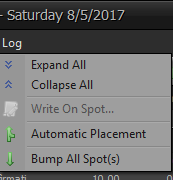 To reschedule Make Good spots, drag and drop them onto the schedule from the log editor. What is the best way to set up my log summary so I can view times spots are to air? All I really want to see is the customers, so if I decide to print the report I don't have a bunch of wasted paper. Right-click on any column header and choose the "Column Chooser" tool from the context menu. In the "Column Chooser" window, click and drag the "Event Type" column to a position on the column header. Close the "Column Chooser" window by clicking on the "X" (upper right-hand corner). Hover your mouse over the "Event Type" column until you see a small funnel appear in the right-hand corner of the columns header. Clicking on the funnel will present a list of existing "Event Type" entries; click on the "Spot" entry. Doing so creates a filter that reduces the information to just the entries that are of "Event Type" "Spot". You can see this filter is active by looking in the lower left-hand corner of the view. Adjust the columns you'd like to have and use the File->Print main menu to send it to your printer. How to handle special events/holidays? When you have a special event like a sports broadcast, live remote or holiday, you may need to make changes to the format for a short time or one day. 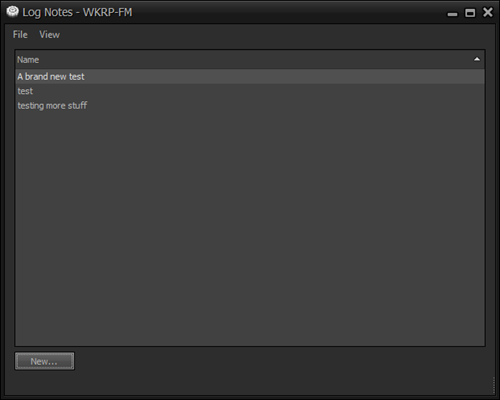 RadioTraffic allows you to make those changes without having to completely rework and resave your format. 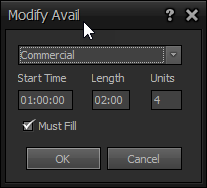 To add a sporting broadcast or other event that is not the entire day long, create a template for the event in your Administration > Templates section as you would for a template to build a full 24-hour format. Make sure that you have something in the template at the very top of the template. 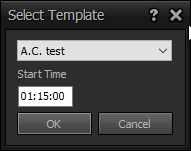 (00:00:00) Save as a template. For a holiday log that will preempt an entire day, make the template the same way you would build a 24-hour format but save it as a template. To insert into the log, open the log for the day you need to place the special template. Right-click anywhere in the log and you will get a list of options. Not seeing the Target Date (or another column) on bottom list(s)? Can I move Saturdays scheduled spots to run on Friday instead without changing the order? If this was a spot per week order you could use the spots from Saturday on Friday but if it is a weekly order than you can only use the spots after they were scheduled to run not before.